£40 per night excluding school holidays. 1 double bedroom, 2 twin rooms and a pullout sofa bed in lounge area. Washing machine in kitchen. (No drier). 18 hole golf course on site. Many extras including highchair and travel cot if requested. Board games, Playstation 2, DVD Player and variety of DVDs, reading books, inside and outside toys. Windbreaker and fold up chairs. Mini shop on site, although by car Tesco is just 10 minutes away. An assortment of eateries in Cleethorpes serving Fish & Chips, Carveries, Chinese - all you can eat for a set price, Taco Bell, Subway ect, ect. There are many things to see and do in and around Cleethorpes. If you do not drive, and plan to travel by train, a pick up service can be arranged to take you to the caravan, and back to the train station on your departure for a small charge. (About a 10 minute drive). Shopping essentials can be arranged for your arrival if requested at least 1 week in advance of your holiday. £50 non-returnable deposit secures your date, and will be deducted from the price of your holiday. 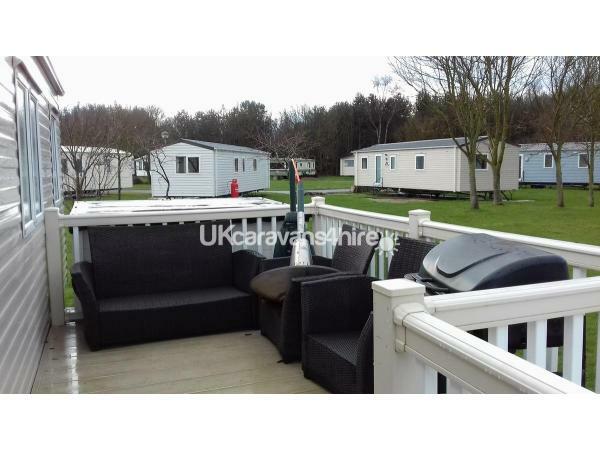 £75 damage bond required, this will be refunded once the caravan has been checked following your departure. Holiday to be paid in full 6 weeks prior to your holiday. for further details, or to book.